The following article explains how to convert an ODP file format to a PDF document with the help of the novaPDF printer driver and LibreOffice. If you do not have novaPDF installed on your computer, use the Download page for downloading and installing the application. The LibreOffice application is a freeware software office suite developed as a fork of OpenOffice by The Document Foundation which includes most of the former developers of OpenOffice. This rupture was a consequence of Oracle's intention of making the office a commercial one and adjusting the development accordingly. The LibreOffice bundle includes the following components - Writer (word processing tool), Calc for spreadsheets, Impress for presentations, Base (MS Access alternative) for database development and management, Draw for vector graphics editing and finally Math for mathematic formulae management and editing. The result of this break-up is an improved version of OpenOffice with unique features added, import filters from other similar suites to be able to support their formats and no more copyright assignment policies from Oracle. The ODP file format is the extension for the presentation file created with the LibreOffice Impress, similar with the MS PowerPoint application. The users can create slides that contain text, images and can import other types of media into the presentation. 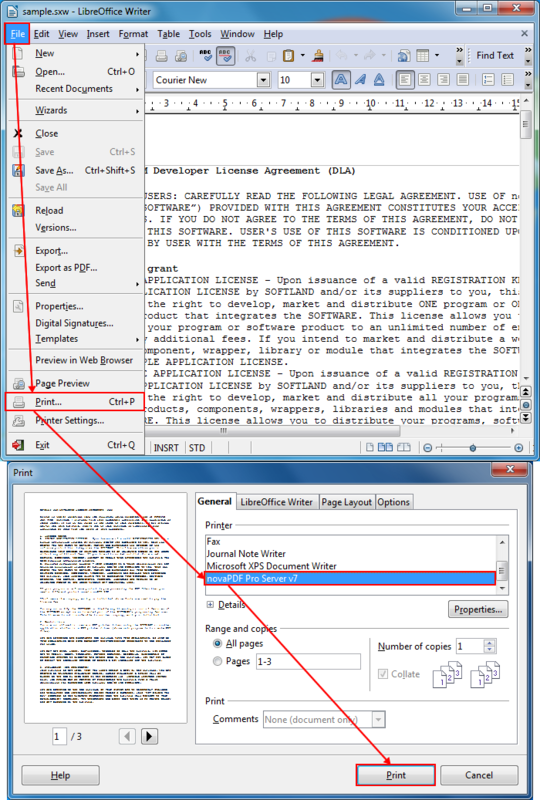 Despite the open document format type, you can only open and edit the presentation if you have LibreOffice installed on the computer. So having the ODP file in a PDF format instead increases the file's manageability, interactivity with users and sharing opportunities. Also in case of sensitive information you can setup security on the PDF so only the people you want can open the document and make modifications on it. Additionally, novaPDF can help you more by setting up signatures on the PDF file, merging the file with other PDF's, create watermarks and bookmarks on the document and at the same time keeping the file quality as high as possible. Open LibreOffice Impress and search for the file you want to convert to PDF by clicking on File->Open (or Ctrl+O). After loading the file, go to File->Print and in the General tab, select novaPDF from the Printer list. By clicking on Properties you can setup novaPDF specific features for the PDF file. Click on Print and after the after any save actions setup click OK to start converting the ODP file. StarOffice doesn't have an integrated export to PDF option, thus in order to convert documents created with it (.sxi) to PDFs you need to install a third party PDF converter.